1. Use a little Pureology Dry Shine lotion on your fingers for easier hold, then section off dry hair into three pieces, like you would begin a standard braid. 2. As you twist the hair together, let go of the third piece each time, and pull through a new third section. 3. 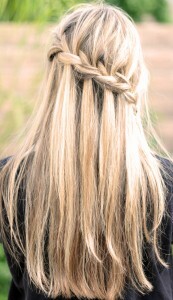 Tug each “falling” piece to tighten the braid and hold the hair in place. Continue the braid from one side of the head to the other until the braid is complete. Fasten with a hair tie, and set with Redken 18 Quick Dry spray.